Well, very very cool. I had expected a small turnout to view the vintage trailers on exhibit at the ACE Hotel, but I was absolutely floored by the response of the Modernism Week attendees. We were only eight trailers (three vintage Airstreams, one new Airstream brought by a local dealer, one Silver Streak, two canned hams, one Spartan, and one other I never did identify). Despite the limited number of trailers to view, hundreds of people bought wristbands for the privilege of coming inside and talking with us. Tours were supposed to be at 10 a.m., noon, and 2 p.m. but there was really almost no letup, so despite an assistant I recruited, there was not much possibility of a break. I didn’t mind. It was terrific to see so many people enjoying the Caravel, and frankly the people-watching was excellent. Modernism Week attracts an enthusiastic design-oriented crowd, so the show was as entertaining for me as it was for them. We’ve owned it 7 years. Yes, it was restored, but this is how it was originally designed. No, that’s a refrigerator, not a dishwasher. When things finally calmed down I joined some local folks for a quick tour around the older part of Palm Springs, where the classic movie stars and numerous other famous people lived. We happened by Elvis’s Honeymoon House, which can be toured, “Casa de Liberace” near downtown, Raymond Loewy’s house, and various others. 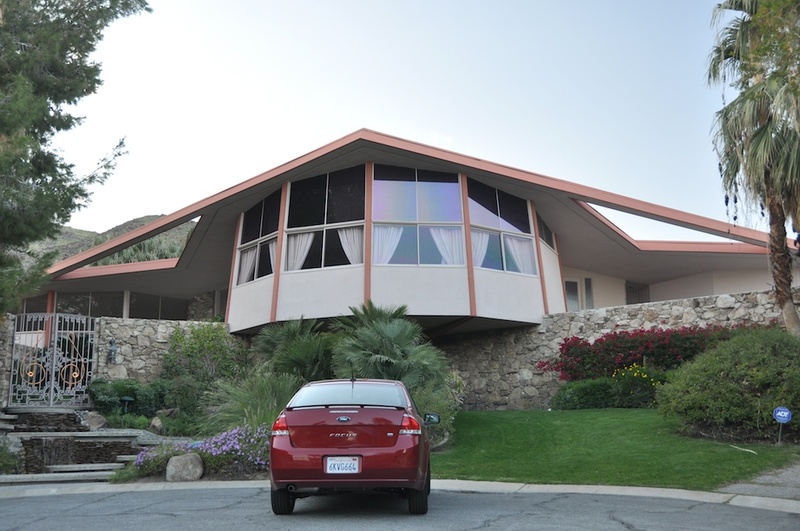 Many of the more exotic homes are well-hidden from public view by tall walls, security gates, and extensive landscaping, but modernist design homes are everywhere in this part of town, so there’s no problem spotting great architecture from your car. The wind was blowing strongly from the west last night, enough to occasionally rock the trailer as I slept at Pegleg in Anza-Borrego Desert State Park. A little rocking is nice when you’re snug and secure in a tight little aluminum cocoon, but unfortunately I discovered that the angle of the wind caused a heretofore unknown flap in the stove vent to make a random tinny banging noise. A wad of paper towel stuffed in the vent blocked the wind enough to stop the flap from banging. I think I will devise a better block, made of foam, for future trips. Eleanor and Emma really owe me for debugging this sort of thing before they go camping in the trailer. Add this to the spontaneously shattering window glass phenomenon that I discovered in the early morning last December, and you can see that the job of Quality Assurance Inspector is not easy. In the morning Bert tapped on the door and invited me out to breakfast at one of the cafes in downtown Borrego Springs. Since he was buying, I couldn’t say no … or to be more accurate, I simply wouldn’t say no. Anyone who cares to buy me a tall stack of blueberry pancakes will find “No” has suddenly disappeared from my vocabulary. Of course we got to talking, and by the time I was back at the trailer I was already late to get to the ACE Hotel & Swim Club in Palm Springs. All of the vintage trailer owners were told that it was very important we arrive in the specific 30-minute parking windows that had been assigned to us, and of course none of us did. I was 25 minutes late, while others were either hours early or late. But we all got parked well enough, in an pedestrian alleyway that divides sections of this former motel, and even before we were disconnected and set up, there was a steady stream of appreciative onlookers checking out the trailers. The Caravel is plugged in just twenty paces from the door of my ground-floor hotel room, so in effect I have sleeping and housekeeping space for about eight people (four in the Caravel, four in the double beds of the room). The refrigerator and cupboard of the trailer are fully stocked with food, so I’ve been going back and forth between hotel and Caravel for meals, which I prepare in the trailer and consume in the hotel room. I didn’t even have to bring much into the room with me, since my entire wardrobe and anything else I might need is already in the trailer. The hotel is quite interesting. Formerly a Westward Ho motel, then a Howard Johnson’s, it was recently done over to the tune (so I’m told) of $35 million. It shows. The rooms are bohemian/modernist/funky, while the grounds and building are cleverly landscaped and very inviting. Tonight in “The Commune” (a gathering place at the hotel) we will be treated to a slide show by “classic and kitsch pop-culture humorist” Charles Phoenix, which I’m told is a must-see. 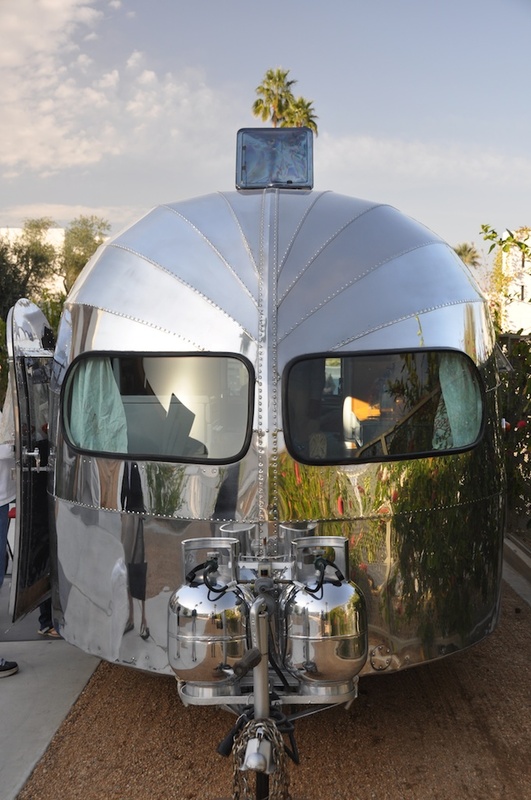 Parked nearby me is Kristiana Spaulding, who many of you may know for her wonderful silver Airstream-themed jewelry. She advertises her work in Airstream Life, which is a good enough reason for me to love her, but in addition she and her husband Greg are great people who I’ve enjoyed meeting for the first time today. 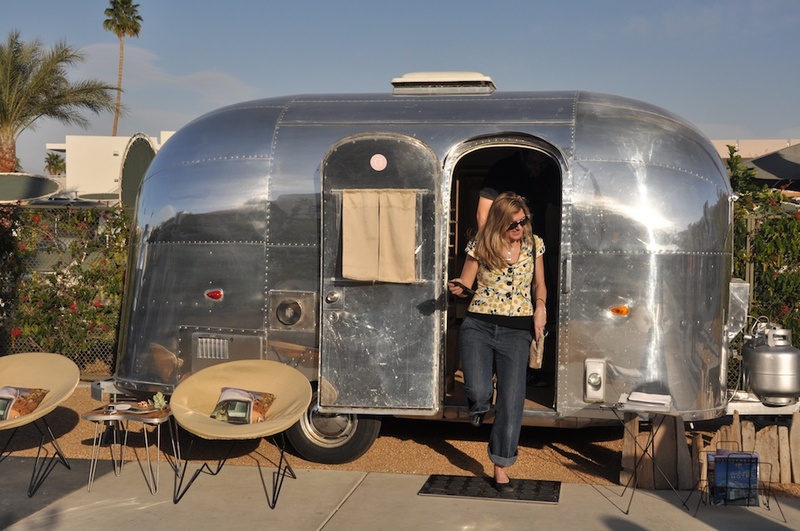 Kristiana is showing her 1962 Bambi, one of many Airstreams she owns. I thought I was a big road-tripper, but apparently from the stories I’m hearing today, I’m not even in Kristiana’s league. She’s based in Lotus CA but makes regular trips to New York. Officially tours start on Saturday. Participants pay $10 per person to get to view the interiors of the trailers and talk to the owners. There will be tours at 10, 12, and 2. As I mentioned in an earlier blog, Eleanor and I have dressed up the Caravel for the event, and yes, I will get some pictures of that for you. But in advance of the tours there have been many people coming by to admire. They try to peek in the windows, and they are taking a lot of pictures. 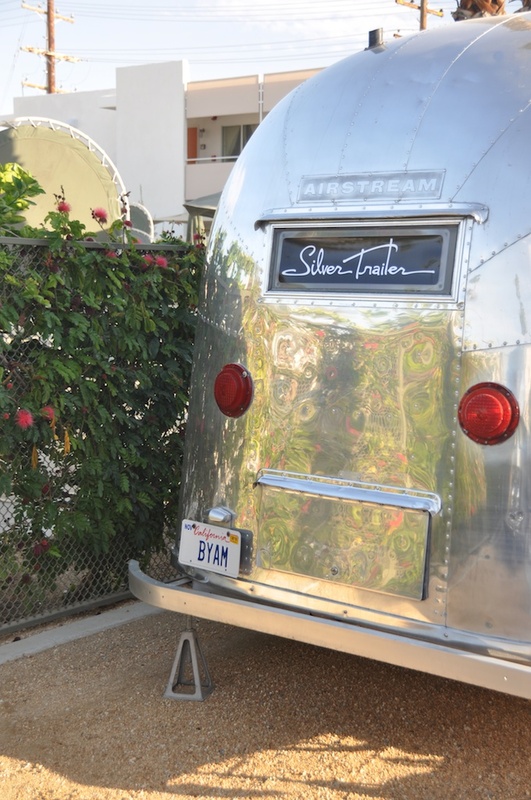 You’d think they’d never seen a vintage Airstream before. I guess I forget how rare — to the general public — they seem to be. And it’s also easy to forget how dramatically people are transfixed by the sight of one of the old aluminum shells. Seeing their reaction to the interior tomorrow should be great fun. It seems like at least once a year a virus enters our lives and messes up some travel plan. 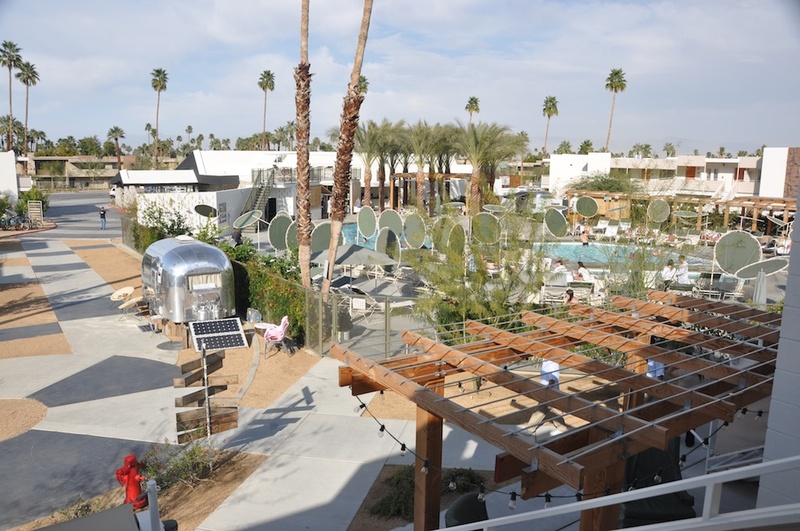 This time it was the long-anticipated trip to Palm Springs for Modernism Week. Yesterday, as we were packing the Caravel, Emma began showing symptoms of “something” with a slight fever and nausea — and as easy as that, our trip evaporated. If we had been planning a trip in the big Airstream, we might have gone anyway. It has plenty of space for a sick kid (her own bedroom), a roomy bath, and all the little comforts of home (extra blankets, comfort foods & tea, room to prop up with pillows and watch movies, etc.) We spent enough years on the road to have many episodes of 24-hour stomach bugs and 7-day colds, and we know we can deal with that even as we travel the country. But this trip was to be spent in our tiny Caravel, a “weekend trailer” that is well-stuffed with three people in it, and two nights of the trip we would be evicted for the Modernism show and sleeping in a hotel room. With all the things going on and the limited space, it didn’t make sense to uproot Emma for a long weekend. So off I went, on my own in the Caravel again. Since I am not expected in Palm Springs until Friday, I was able to take the scenic route along I-8 through the southern Sonoran desert. This allowed me to avoid Phoenix (always appreciated when towing), plus I was able to see the desert already green and starting to bloom from all the rain we’ve gotten this winter. It will be a beautiful spring this year. Along I-8 in Arizona there isn’t a lot to see from the highway, but a few stops are worth making. One is Dateland, a tiny oasis where you can take a break, buy fuel, and most importantly shop for eight or more varieties of locally-grown dates. Actually, that’s hardly doing justice to the date theme of Dateland. You can also get a terrific date shake, and park any size of RV near the groves of date palms that line the southern flank of the rest area. It was a good spot to stop for lunch in the Airstream, in stunning clear and warm weather, approaching 80 degrees already. Since I was taking I-8, I decided to drop in for one night to see Bert & Janie, Eric & Sue, at Anza-Borrego. Bert and Janie have been boondocked at Pegleg for two months now, and show no signs of wanting to go anywhere, which is unusual for them. Eric and Sue are fellow outdoor writers and photographers, who we last met a couple of years ago in Yellowstone National Park. Stopping at Anza-Borrego would add about 50 miles to my trip, but it had the compensation of a chance to see good friends for an evening rather than boondocking somewhere alone. Tonight in Pegleg, it is cooling off rapidly and the wind has been up since 4 p.m. We started the evening with a fire in the handmade rock circle that Bert built, and talked about the brilliant star constellations overhead, but with the chill setting in it wasn’t long before the group broke up and retreated their individual homes. In addition to my friends, there at least a couple of dozen long-term residents of Pegleg, all of whom are feeling their trailers rocking in the breeze as the evening deepens. Most likely I will be the only one leaving in the morning. 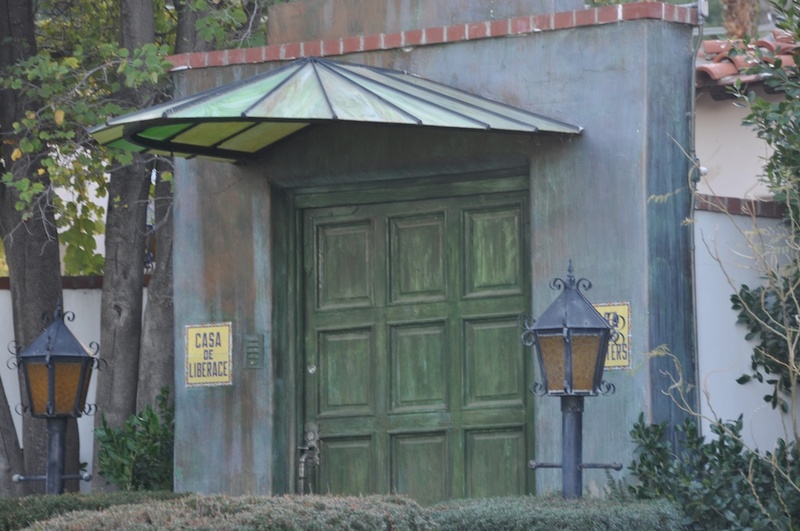 The rest of the residents have little incentive to leave this free and quiet parking spot. Part of me would like to stay and stretch out like the others have, but mostly I am looking forward to what Palm Springs has to offer. By 10 a.m., I’ll be towing the Caravel again, to see what’s over the next hill. For the past couple of weeks we’ve been prepping to go to Palm Springs for Modernism Week. We, along with a few other vintage trailer owners, will be on exhibit at the Ace Hotel on Saturday February 20. There’s not much that we need to do except clean up the trailer and pack for a few nights, but the opportunity to get into the modernism spirit has gradually overtaken us. That means “accessories” circa 1968, so we have a prop box going to collect the things that will help set the mood of 1968 as people tour the trailer. 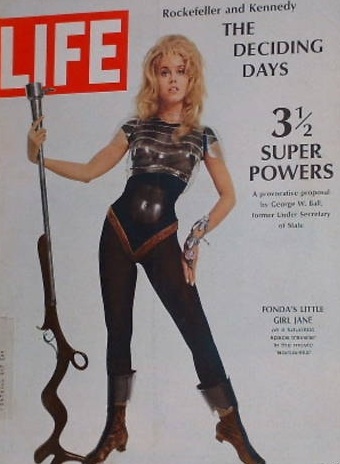 At this point we have some Melmac dishware, a couple of Life magazines (Jane Fonda as Barbarella on the cover of one), a transistor radio (non-working), an old plaid Thermos, some James Bond paperbacks, Jiffy-Pop, and various other things. The problem is that accessorizing can be addictive, so it wasn’t long before Eleanor was making 60’s-looking pillow shams, and hunting up giant peace-sign earrings for herself at the resale shops. Then I spent an evening collecting three hours worth of 1968 music for the iPod, which will play from a hidden location inside the trailer. Now Eleanor has an entire costume for herself, and she’s begun to dress me as well. Of course, anything I wear from the 1960s is destined to look immensely nerdy. Since I currently have close-cropped hair, I’m going to run with the nerd look and perhaps don a clip-on tie or find some dorky pants. That shouldn’t be hard. Eleanor, on the other hand, will be looking more like a flower child. Emma will probably just be hiding from embarrassment the entire time, so she won’t need a costume. We eventually kept upgrading the Caravel until it was no longer inexpensive. Worse, somehow along the way the trailer became the star, and we became its agents. I’ve camped in it exactly four nights in the past five years, and all of those nights have been in service of the trailer itself, not for my own recreation. Now it has become so exotic that to take it out we need to dress it up first. It is a sort of trophy trailer. Well, that won’t last. We don’t own things just for the sake of having them. Everything has to have a purpose, or it soon finds another home. This little voyage may be just the thing we need to “break in” the trailer, and make it our own again. Probably the passage of time has done as much to separate us from the Caravel as the refurbishing. 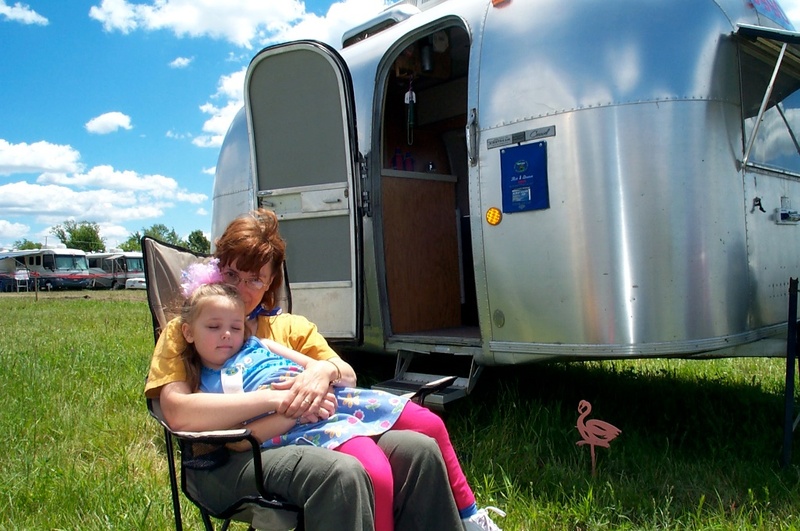 On our last trip in the trailer, Emma was a four-year-old toddler and her parents were still novices at trailer travel. Our formative memories were riddled with minor disasters coupled with wonderful irreplaceable memories. The trailer got dusty every time we towed (from the floor rot), the black tank oozed out the top and smelled terrible when it got full, the bed foam was painfully uncomfortable, the windows leaked, and the spare tire didn’t fit. It was dented, and festooned with all sorts of ridiculous non-period things, like a giant white air conditioner that sat on the roof like a goofy cap. Yet we loved the trailer and the adventures it led us to, enough to invest five times the purchase price in refurbishing it over the next several years. This was a leap of faith. We were trusting that it would lead us to more adventures and bonding once we had it back. Now we shall find out. I expect that we’ll come to know and love the “new” Caravel very quickly. Just spending a few nights in it at Quartzsite I came to remember how fun it is, how neat & compact, how I get the exciting sensation of camping when I sleep in it, how much it is a joy it is just to look at the rounded silvery proportions of it. Even though Emma is no longer the tiny toddler that we remember tucking in on the dinette, there are good memories ahead to be made with the nearly ten-year-old kid we have today. But if things don’t work out, there won’t be any trouble finding a new owner for the trailer. 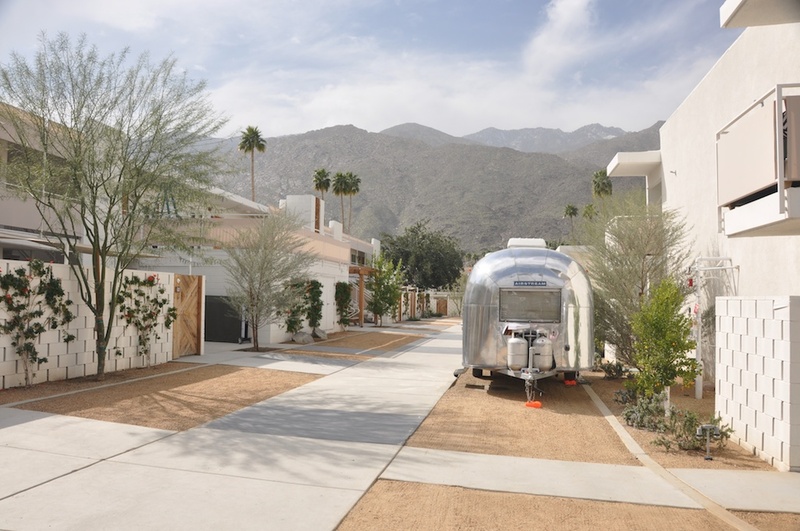 We are allowed to solicit buyers at the Modernism Show if we wish, and I’ll surprised if there aren’t a few folks in Palm Springs next weekend prowling the show for a nice restored trailer. We’ll be on the road Wednesday night, and as always, I’ll blog from the road frequently until we get back to winter home base. Towing a big trailer intimidates a lot of people when they try it for the first time. It should, because you can very quickly get into trouble when towing. It requires drivers to learn a new set of skills, and apply good driving practices at all times. I think it is particularly intimidating when you’ve just signed a loan agreement obligating you to 10 years of monthly payments, and you realize that a considerable portion of your net worth is now rolling along with you, presenting a large and shiny target for every nutcase driver on the road. 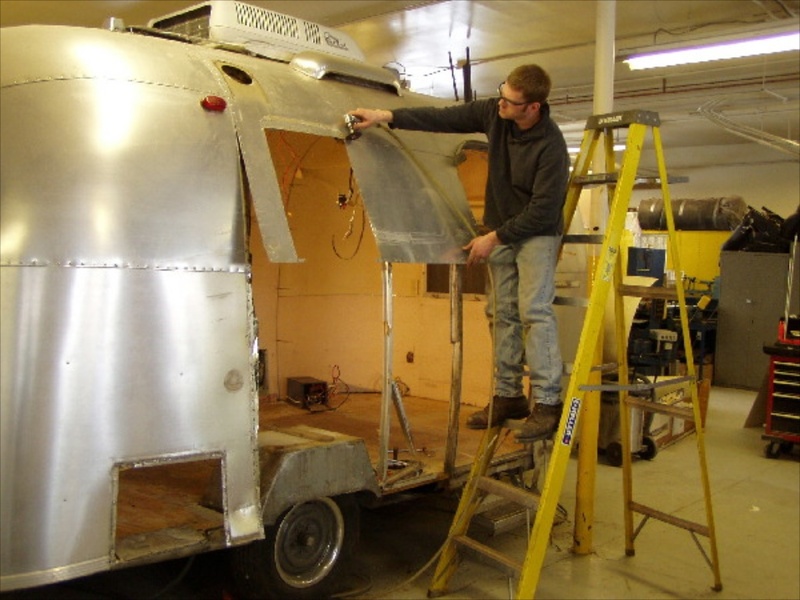 A new truck/Airstream combination can easily come in at $80-100k. Atop that, there’s the knowledge that you, your family, and your dog are all going to be involved in any accident you get into. So suddenly those “defensive driving” tips you have taken not-so-seriously rise to an unprecedented level of importance. Suddenly you’re the one cursing that guy who cut in between you and the car in front of you, using up all the distance and reducing your time to react. Now you’re paying attention to the rollover warning sign on the Interstate exit ramp, and the 25-MPH speed limit on the big cloverleaf intersection. You realize, “Hey, they mean me” when you are towing two or three tons of expensive housing behind you. In late 2000, Eleanor had a rollover accident with baby Emma in the car, and ever since I’ve been interested in getting both of us some advanced driver training. We know how to drive, but do we really have the instincts to react properly when it all suddenly goes very wrong at 60 MPH? I’d like us both to have some more confidence about our abilities in adverse situations, and the trained reactions to avoid a crash. Now, after years of Airstream ownership and years of full-time travel, I am pretty sure I know how to handle my Airstream. The number one rule is simple: SLOW DOWN. There are many other practical rules as well, involving getting in and out of tight spots, evaluating situations before getting trapped in them, backing up, passing, rough roads, etc. I’ve got all those pretty well figured out by now, mostly as a result of painful experience. The thing that concerns me about towing is not the trailer, but the tow vehicle. Most tow vehicles have a high center of gravity and are more prone to rollover than the average car. 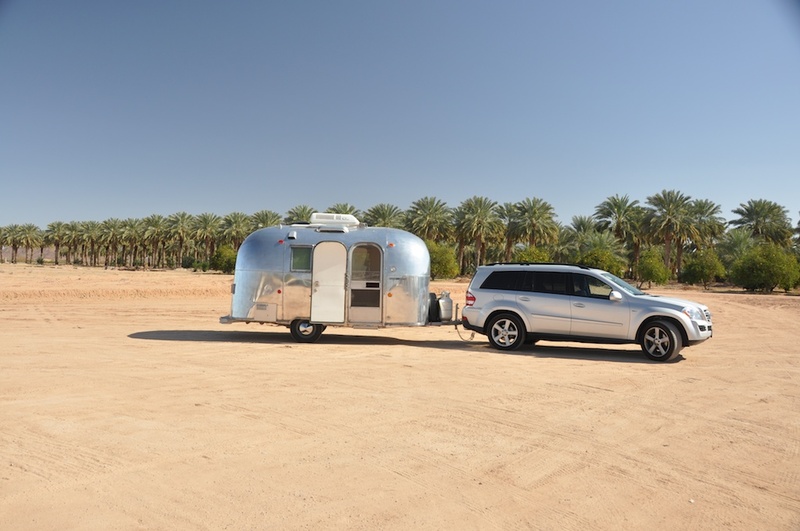 Adding an Airstream actually tends to help with this, by putting weight down low and stabilizing the vehicle — if properly hitched. But adding people, fuel, and cargo usually raises the center of gravity in an SUV, and most drivers aren’t aware of this until they notice adverse handling. Moreover, pickup trucks and SUVs are generally lousy at high-speed maneuvers. They aren’t designed for that. You’ve got a narrow maneuverability envelope to work in at highway speeds. Exceed the envelope, and the tow vehicle will go out of control, often without much advance warning. That’s further reason to understand the limits of your vehicle, and to train yourself how to react properly. Last weekend a local car club was holding a “Defensive Driving” course up in Phoenix, and we signed up. 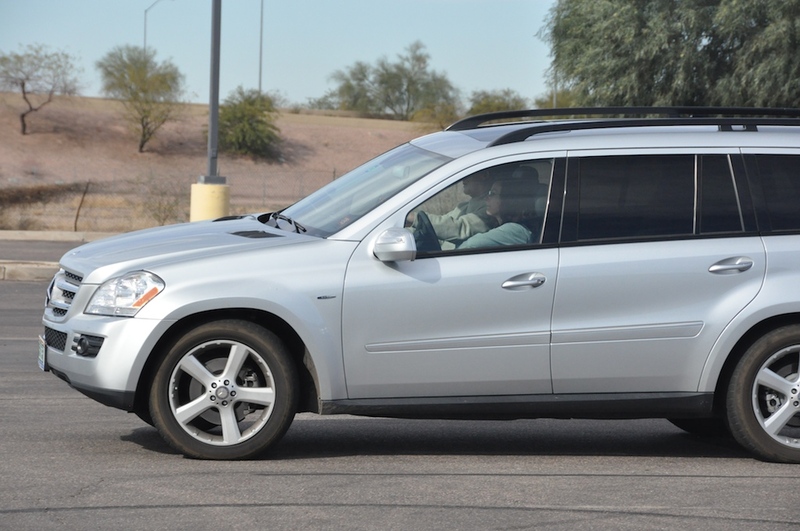 The instructors recommended showing up in the vehicle you drive the most, so we brought our Airstream’s tow vehicle, the Mercedes GL320. At 6,000+ pounds, it was by far the largest and heaviest car on the track. Most people were in small sedans or sportscars. The course included about half an hour of “chalk talk” followed by individual instruction on a course set out in the parking lot of a former Wal-Mart. We took turns driving through the course with an instructor in the right seat. The tasks included an emergency lane-change maneuver, a slalom, an emergency brake followed by immediate lane change, and a panic stop strong enough to engage the anti-lock brakes. I thought all of this would be routine, but I was surprised. Each task had an unexpected element to it. In the emergency lane change, I discovered how easy it is to go the wrong way when you’ve got to make a snap decision. In the slalom, I was frankly amazed at the handling of the GL320 — it went through much faster than I had expected. The panic stop was a particular challenge for me. I thought I was pressing pretty hard on the brakes, but I had to try three times before getting the ABS to kick in. Once I did, the GL320 came a stop really fast. Turns out that I’ve been holding back on the brakes, probably as a result of learning to drive up in Vermont without ABS, in the snow, where you’ve got to keep a light foot on the brake to avoid skidding. Old habits die hard, but that one needs to go. The ABS computer can do a better job of modulating the brake pressure than I can. After lunch, the course was re-set as an autocross. Racing your “daily driver” through the course is the icing on the cake at these events. We walked the course twice, then Eleanor and I each took a couple of tries at it. On our second try, we were timed. 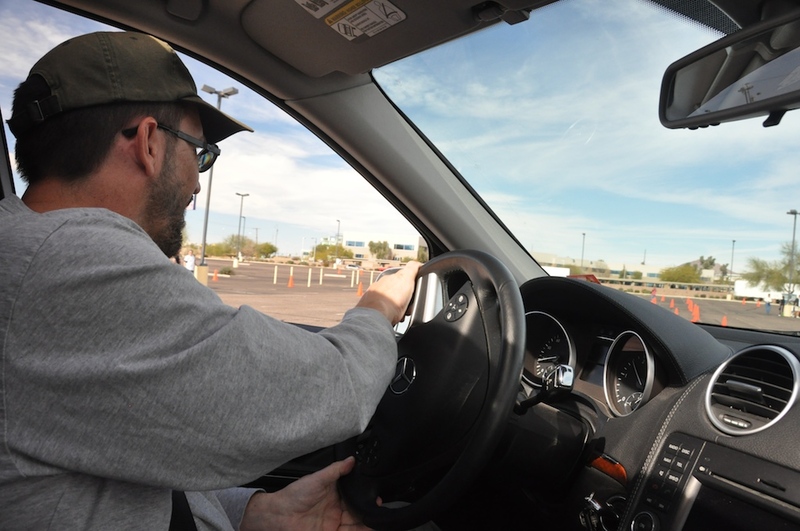 You can see me driving the autocross course at our Airstream Life photo/video community. My time was 49 seconds, Eleanor’s was 51. Not bad actually, considering the vehicle we were in. (Our past tow vehicle, a much larger and taller Nissan Armada, probably would have skidded excessively or tipped over if I’d driven it that hard.) The best time of the day was set by a past national autocross winner, at 38 seconds (in a Mercedes E300), and I think the highest time was 55 seconds. Sure enough, leaving the event I had a sense of much greater confidence in the vehicle, knowing much more accurately how far I could push it in a turning or braking maneuver. We’re far from professional drivers at this point, but the day was well spent and I hope we’ll advance our skills later in another similar event.